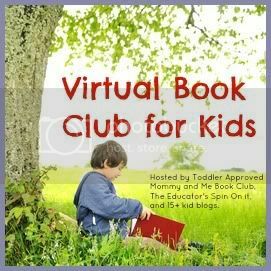 It’s time again for the Virtual Book Club. Each month a different author is featured. Everyone participating then selects a book by the chosen author and creates an activity to accompany the book. The featured author for February is Dr. Seuss. There are so many fun Dr. Seuss books to choose from. In fact, in most libraries you will find a whole shelf devoted to the beloved author. For this post, we settled on I Can Read With My Eyes Shut! I Can Read With My Eyes Shut! celebrates all the things we discover from reading. 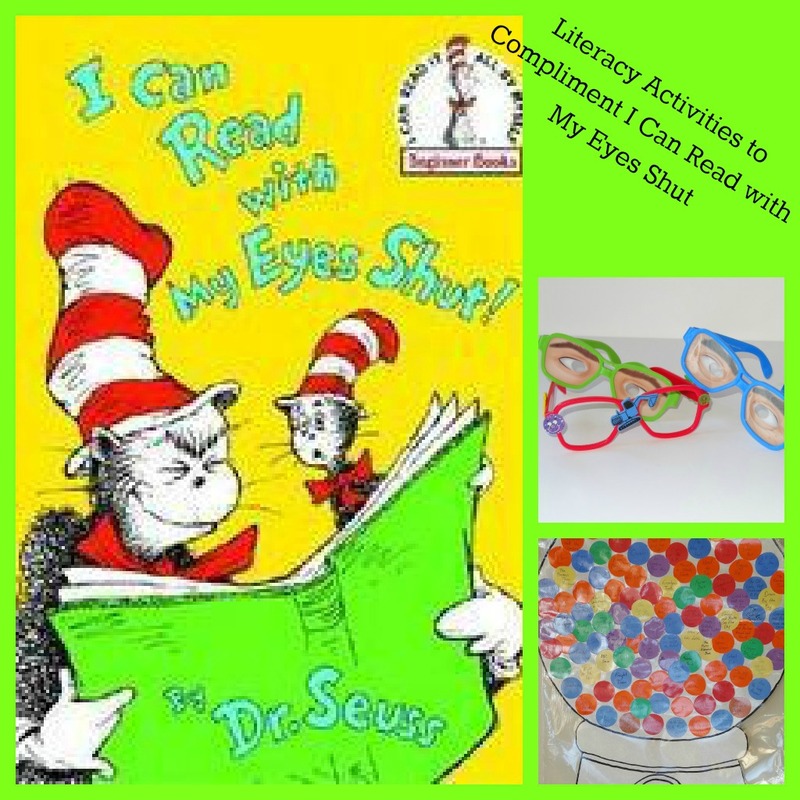 The story is told by the Cat in the Hat as he shows us all the fun that is to be had from keeping your eyes open and reading. I just love this quote from the book. After several readings of the book, we were inspired to create two literacy activities to compliment the text. As a classroom teacher, I liked to show my kids how many books we were reading over the course of the year. 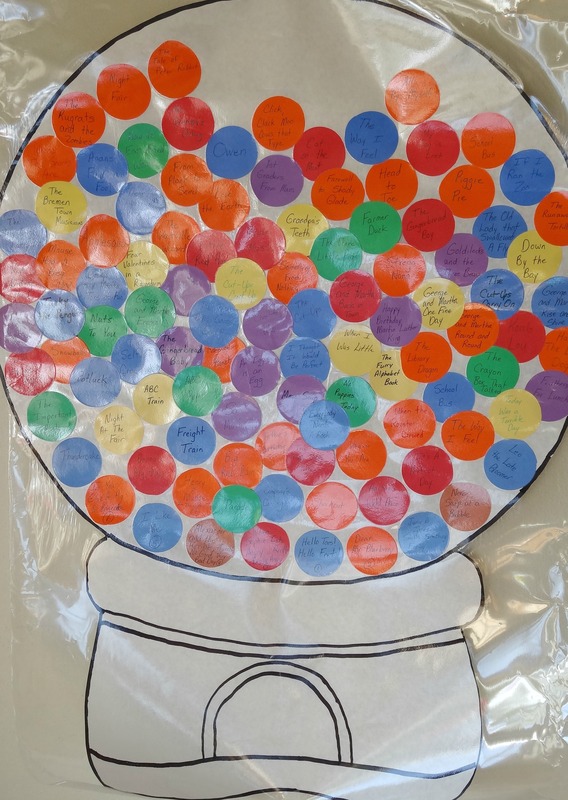 One year I created this gum ball machine to showcase our reading. Each time we read a book as a class, we wrote the name of the book on a gumball and added it to our machine. I’ve also seen this done with paper links to create a chain that can wrap around the room. During the first year of my boys’ lives, I kept a journal of the first 100 books I read to them. What other ideas can you think of to keep track of how many books or topics your kids are learning about? 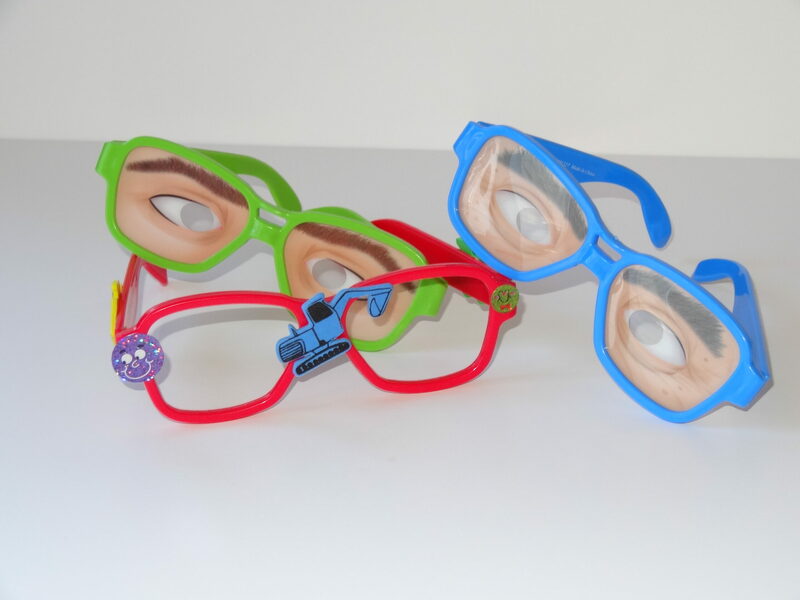 Reading can be so much more fun with a groovy pair of reading glasses. You can even embelish a plain pair for some extra zing. Don’t forget to check out other books and activities centered around work of Dr. Seuss at one of the great blogs listed below. You can also add your own Dr. Seuss idea below. And, join us next month for Julia Donaldson books! I love how all the Dr. Seuss books and projects are coming out at this time of year! I LOVE your gumball idea. I might even use that in our house as a way to keep track of how much my kids are reading. Thanks for linking this into the Kid Lit Blog Hop! I think that the onus here is not only on loving to read but also loving to collect books. When I look at my own library, I am proud of my collection and what I have read. In this digital world, people do not collect hard copies so much; however, they can still have a digital collection. I think it important, as others have said, that we have books available to reread. We continue ordering the same meals in the same restaurants because we love them so much. Books can be used in the same analogy. I love how this blog hop is featuring Dr. Seuss’ lesser known works! Many are new to me and I’m enjoying reading about them and the activities! I like the book tracking ideas–I’ve never thought of that–and Marissa’s goal of 1000 books is awesome. I’d like to do something like that, but we tend to read a few books A LOT of times. How would you count that? You could easily add a gumball each time you reread a book too. Reading a book over and over has so many benefits. I really love your idea for recording books. We have a goal of reading 1,000 books and this would be a neat, visual way to display it. We could even do 10 gumball machines of 100 books and work in a little math lesson. Thanks for the great idea! That’s a great idea and fun goal! Good luck!